I recently got back from a week in California. It was my first time there, to many people’s surprise, and I was able to do a lot of very cool things in seven short days. Originally, I was only going for a long weekend in Santa Barbara for a bachelorette party I’d planned for a good friend, but when Mayim found out I was going to be so close to LA she asked me to stay with her and hang out. It’s hard to pass up an invitation from your boss, so I gladly accepted. 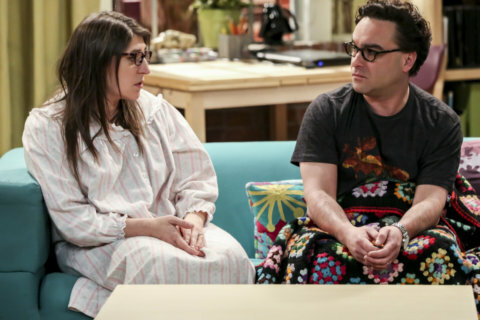 If you’ve ever wondered what it’s like to spend half a week with Mayim Bialik, here’s a rundown! After leaving semi-sunny Santa Barbara, my friend, the bride-to-be, drove me into LA to find Mayim’s house. I arrived at Mayim’s place around 10:45 a.m. and said goodbye to my bachelorette comrades. Winding my way to Mayim’s door I heard a little voice say, “hello?” Miles, her oldest son, popped his head out the front door to greet me and usher me in. I’d never met her boys before and hoped they wouldn’t be too weirded out by a stranger/their mom’s employee staying in their home. 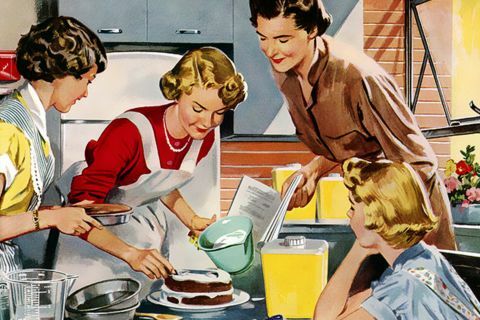 They were very welcoming, much like their mother, and I began settling in while they busied themselves getting ready for their day. I already knew the three of them were going out to lunch and I would be hanging back to get cleaned up before our big night. 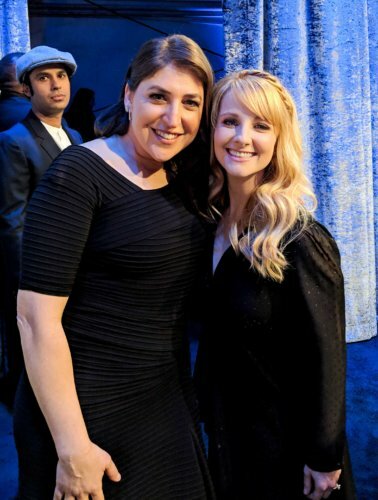 Mayim was attending the Critics’ Choice Awards, and I was her guest! 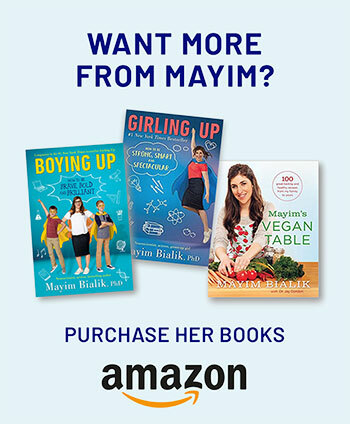 I’m not ashamed to say I poked around Mayim’s house while they were gone. It’s not like I was opening drawers or anything, just taking it all in. It’s a really beautiful space, but the thing that I really took from it was how homey and normal it was. It’s not the flashy, Hollywood house you would expect of someone who’s been on television since she was a teenager. It’s the kind of house you’d expect Mayim to live in. Granted, it’s a house of size with a beautiful garden space and very private, and she also has an incredible copper soaking tub in her upstairs bathroom. But it’s still modest and welcoming and not at all overwhelming. When Mayim and the boys got back it was time for the glam squad to arrive to begin the transformation process. I met Emily, her hair stylist for the evening, and Chanel, Mayim’s good friend and makeup artist, and gladly watched them work their magic. 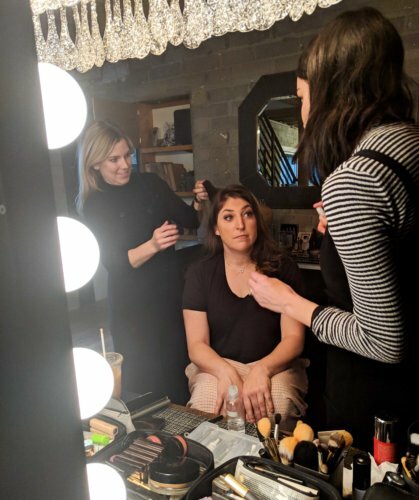 Emily Dawn does Mayim’s hair while Chanel Cross perfects her makeup. Once she was ready, Mayim and I hopped into a car and set off for the awards. Talk about a weird venue. The CCAs take place in an airplane hangar and it really doesn’t look like a place where you’d stumble across celebrities like Nicole Kidman. Mayim, as we all know, is a fangirl. She famously freaked out when she met Mark Hamill the first time. So you can guess how fun she is to be around when there’s a bevy of famous people in every corner. She was excited to say hello to Ben Stiller, whereas I was excited to stand a couple feet away from Bradley Whitford. (Like, very excited.) She grabbed my arm when Eugene Levy and Catherine O’Hara walked into the green room. The whole night was like this. 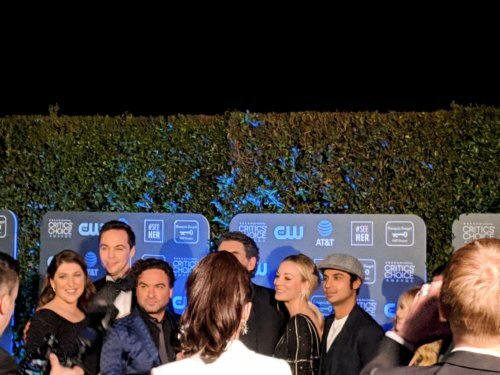 Since the Big Bang cast was there to present an award to Chuck Lorre, I was able to meet almost all of them that night. It was fun to see them all interact so casually. And by casually I mean in black-tie attire. Simon and Kunal were very nice, Melissa was super sweet. I held her purse while they all went onstage. It felt good to be useful. I was able to hang back while they all presented and saw even more famous people. Kristen Bell and D’Arcy Carden (gorgeous humans), Connie Britton (actual ray of sunshine), the entire cast of Crazy Rich Asians (overwhelmingly good looking). Rachel Brosnahan blocked my shot at one point. It was really quite an evening. Mayim came offstage excited to tell me she made eye-contact with Lady Gaga and we made a beeline for the car. After passing literal giant Nicole Kidman we ran into Rachel Bloom and her hilarious parents and stopped for a photo. These are sentences I have never imagined writing, folks, that’s why I’m writing them now. Are they trivial encounters? Of course, but if you go to LA and don’t tell your friends what celebrities you saw, did you even go? When we got back to Mayim’s house we decided to de-glam and take the boys out for dinner. They enthusiastically decided on Little Pine, the vegan restaurant run by the musician Moby. Here is where I should tell you that I’m not vegan. I am, however, a semi-adventurous eater and enjoy food quite a bit, so I was looking forward to trying all the vegan goodies LA had to offer. Little Pine did not disappoint—in fact, it’s some of the best food I’ve ever had. It was also super fun to get to know Miles and Fred. They’re really great kids and excellent conversationalists. When they found out I used to work at Disney World they told me how much they enjoy going to Disneyland, so basically, we were best friends from that point on. Speaking of Disney, Mayim snapped into tour guide mode on the drive home and drove past the Disney cottages and Walt Disney’s old house, which was a real treat to see in person. It’s hard to believe that that’s just a normal California thing. On Monday I was able to get some work done in the morning while Mayim took her boys to their dad’s and ran some errands. Mostly I hung out with the cats until it was time for Mayim’s assistant Brandon to come pick me up. After picking up some lunch from Veggie Grill (another vegan experience for me), we met Mayim and I got to see how her short film is coming along. Then it was time to head to Warner Bros. Studios for the show’s pre-taped scenes. 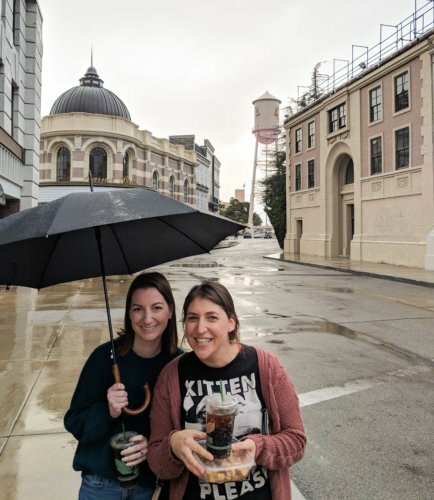 When we got to the lot, it was raining pretty heavily, so Mayim took me on a little driving tour of the studio. Mayim is a consummate tour guide, I have to say. She pointed out interesting buildings, different stages and offices, and some of the facades seen in all sorts of WB productions. When we got to the Big Bang stage, I mostly hung out in her dressing room and caught up on work. I was able to watch the scenes being taped on a little TV with a 4 channel split. 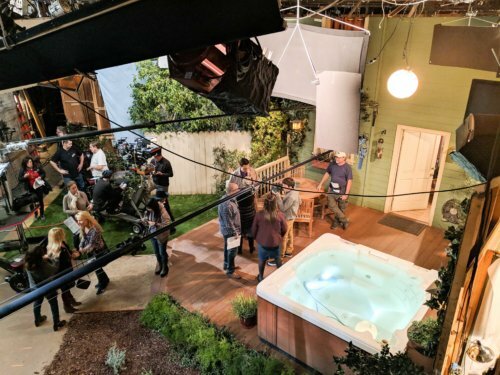 Seeing the process of filming a traditional sitcom is a real trip—how many times they film a certain scene, rewrites that make a joke funnier, how loudly the crew laughs when there’s no live audience. It was fascinating. Also, everyone who works there is incredibly nice! It was especially nice to get to sit with Mayim backstage and just chat with her at work. I listened as she took calls in between scenes, and was able to get a very clear idea of how busy her days are. It’s given me a much better understanding of her life, I think. It also makes my job a lot easier! After taping we decided to go a little nuts and pick up fast food for dinner. Since this was my first time in California, I told Mayim I’d never had In-n-Out before, so she made sure we swung through a drive-thru. After procuring my Double Double and fries Mayim felt inspired to go to McDonald’s and order a Big Mac—no meat, no cheese. Yes, that’s just a pickle sandwich, and yes, she enjoyed it quite a bit. Tuesday was my last full day in LA, and it was a big one: tape day. After picking up Mayim from her yoga class, we went to the studio lot so she could start getting ready. I got some work done in her dressing room again, took a few pictures to keep in my social media vault, and impatiently waited for 6 p.m. to roll around. 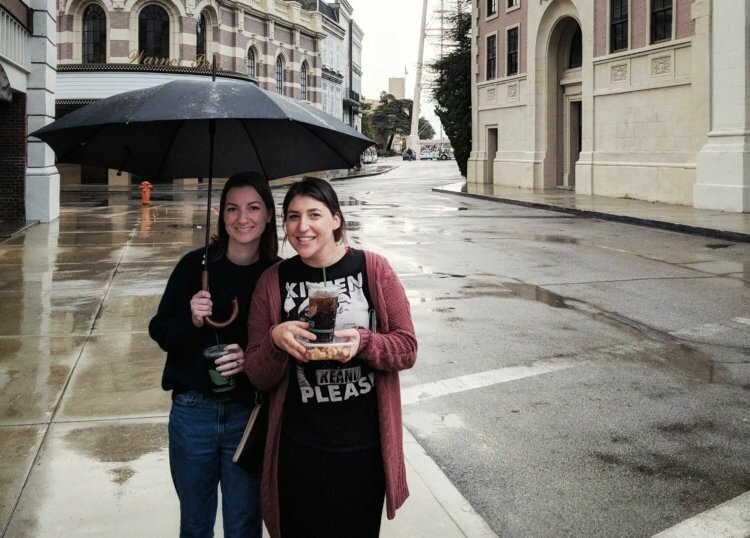 At one point, Mayim and I braved the rain to take a walk and ended up at the studio commissary. We also chit-chatted with Melissa a bit, which was nice. Super casual, I just hang out with celebrities now. No big deal. Posing in the rain in front of the iconic WB water tower! Soon it was time for me to leave my phone behind and take my place in the live studio audience. Some of Mayim’s friends were also coming to the taping, and I was able to meet them and have company. I know some of our readers have had the opportunity to attend a live taping before, but for those who haven’t, here’s how it works. Once everyone is seated, the audience warm-up person will start explaining the process and getting everyone hyped up and ready to laugh loudly. The cast will come out for introductions and from there the filming begins. 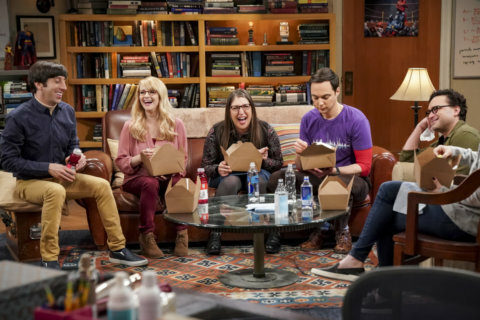 Big Bang is filmed in chronological order on live tape day, so they start from the beginning and work their way to the end. If any scenes were pre-taped they will play them back for the audience and record their live laughter for use in the episode. In between takes the warm-up person will entertain the audience to keep them engaged, and at one point we even got a break where they brought out pizza and water for the audience. The whole process took a couple hours altogether and was such a cool experience. Being able to see writers change lines on the fly and turn them into something that lands better, or see the actors read lines ever so slightly differently in different takes was really neat. After the taping was finished, Mayim’s friends and I were able to walk down onto the stage to say hello to whoever stuck around. 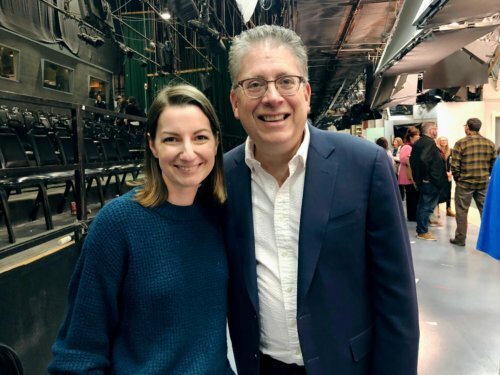 I’d been telling Mayim for weeks that the only person I wanted to meet was the show’s co-creator Bill Prady, and she must have forewarned him. If you don’t know, Bill got his start in Hollywood working for Jim Henson and had a hand in several Muppet productions, including an attraction that still operates at Disney’s Hollywood Studios in Florida called Muppet*Vision 3-D. As my previous writing will tell you, I’m a huge Muppet nerd so meeting Bill was especially exciting for me. He was very kind and talked with me for a few minutes, and I’m grateful to both him and Mayim for indulging my fangirling. This is actually what I call my excited Muppet face, so, it’s appropriate. Thus concluded our evening on the lot, and Mayim and I went back to her house for a nightcap, a chat about work and life, and went to bed. I left very early the next morning to head back to the frigid Midwest, where it had snowed several inches in my absence. Though California was not so sunny during my stay, I found it to be a warm and welcoming place. Mayim and I get to know each other better each time we’re able to be together and I’m very thankful to her for opening up her home to me. 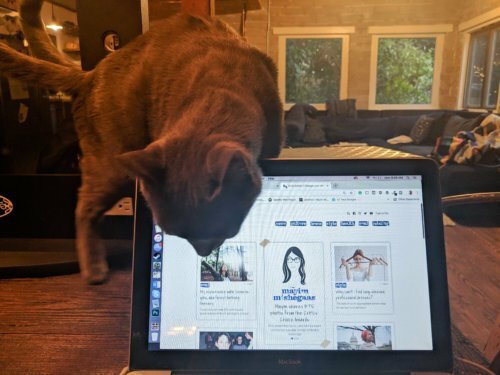 Some people thought it was weird that I was going to be staying in my boss’ house, but I think Mayim and I would agree that our working relationship is much more friendly than average. Hopefully, I can make it out to LA again soon and get a special Mayim-led tour in the sun!